Laurito (pop. 1000) is one of the 80 small hill towns of the Cilento. It is about 15 km from the sea, the gulf of Policastro, and is within the Cilento and Vallo di Diano national park in the province of Salerno. Almost all of these towns have something they boast about, something that defines them —this or that festival, agricultural product, tradition, etc. In the case of Laurito, the town owes much to the fascinating Byzantine influence over the area staring in the 9th century AD when Basilian monks,* mostly refugees from the Arab invasion of Sicily, settled here in that period. The monks took to the rocky hills of the area and built small isolated shelters to live and worship in. The structures, called laure have given the town its name. Beginning in 947 there was a succession of various rulers, from the Lombards to the Normans as well as various feudal families. During this period, the Byzantine influence continued and that heritage has left significant traces in the local artwork. 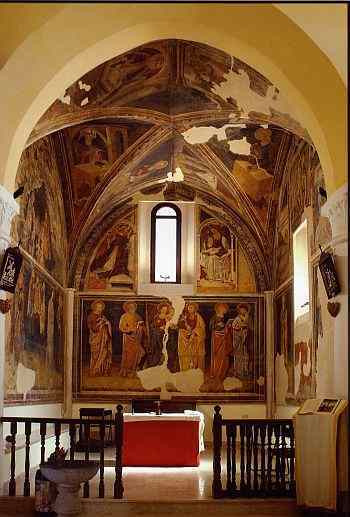 The most striking example is the 12th-century chapel of San Filippo d'Agira, a 14th-century addition to which contains a remarkable series of frescoes adorning the walls and high vault (photo, above, right). The "mystery" has to do with just how much Byzantine influence is really in these frescoes and where it might have come from and how. The part of the chapel with the frescoes seems, indeed, to be an add-on to the original building. Current thinking dates the original chapel to the 1100s and the vaulted addition to the 1300s. The vaulted part is at the back; it does, indeed, look as if it was tacked on. 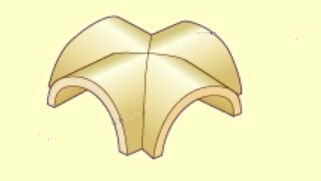 The vault is a cross vault (or double barrel vault or groin vault); that is, a vault formed by two intersecting half-cylinders (image, right). Imagine it placed above a rectangular room and you pretty much have that part of the chapel of St. Phillip of Agira in Laurito. There is one side open to rest of the church; everything else is for painting. from the center of the room. Until quite recently the frescoes have eluded the real attention of critics except for small accounts in which the cycle of frescoes was dated to around 1425 and attributed to two distinct artists. Popular literature on the chapel refers to the frescoes as "Byzantine," a very vague term. Hans Belting (sources, below) points out that, yes, Greek culture in the south persisted until well after Byzantine political power had waned, but much of the art we call "Byzantine" in southern Italy was not done by Greek artists, but by Latin imitators and that even the Greek artists were working for Latin patrons. The point is that we should not take a popular reference to "Byzantine" to mean "artists from Constantinople who dropped by to paint a church sometime in the 10th or 11th century." The frescoes in Laurito are from the 1400s; stylistically, they do have Greek elements, but they also display features similar to western Christian art from the early Italian Renaissance and even to individual works by known artists. Specifically, the available serious critical comments on the frescoes make comparisons to Perinetto da Benevento, important for his work in 15th-century Campanian painting, specifically, to his frescoes in the Cappella Caracciolo in the church of San Giovanni a Carbonara in Naples; also to an entire style of the early 1400s called "Pierfrancescan" (in reference to Piero della Francesca (c.1415–1492), whose work was characterized by the use of geometric forms and perspective. Even the rocky pedestal that the Apostles are standing on looks like The Departure of St. George painted in Verona by Pisanello between 1433 and 1438. And the Flagellation—the ballet-like poses recall the older story frescoes of St. John the Baptist by the Salimbeni brothers. Also, some of the comparisons are to Catalan painting of the 14th and 15th centuries and to works from very late in the 1400s and even the early 1500s, which compounds the mysteries: Who painted them? Do we know the artists from other works? Are they anonymous copiers or did others copy from them? And so forth. The frescoes were restored in the early 1980s. They were were painstakingly removed with the underlying stucco, mounted on metal frames, transported to Rome, restored by experts, moved back and reinstalled such that air can now pass them around them properly and keep them dry. I hope you didn't expect me to solve the mystery for you! The book will be out soon. Stay tuned. —Belting, Hans. (1974) "Byzantine Art among Greeks and Latins in Southern Italy" in Dumbarton Oaks Papers, Vol. 28, pp. 1-29. Pub. by: Dumbarton Oaks, Trustees for Harvard University. —Botte, Francesco. (2012) Personal interview and an unsigned information sheet on the frescoes entitled, Laurito– Chiesa di San Filippo d’Agira (XIII° Sec.) – Gli affreschi (XV° sec.) printed by the Laurito town council. —"Laurito" (2008). Ed. Carlo Soldatini. Entry in Il Parco e i suoi volti, I Comuni del parco Nazionale del Cilento e Vallo di Diano, promotional pamphlet n. S 11 PNCVD INV. DGT DGR Campania n. 1502 of 29.02.2004. The other day Francesco Botte drove into Naples with a copy of The Book—"a little late, but we did it!" said he. Indeed they did. 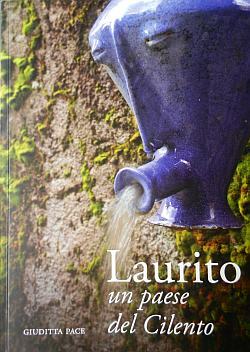 Laurito, un paese del Cilento [a town of the Cilento] by Giuditta Pace. 2014, GAL Casacastra, Futani (Salerno). Glossy paper, 203 pages. Lavishly illustrated and a complete history of the town, from prehistoric Neanderthal fragments to the present. I don't think I have ever seen something this well-done put out by such a small community. The general consensus of those who worked on the book was that they had to do something since they were already getting a lot of helter-skelter attention from art critics due to the frescoes, so they might as well do it up right. Fully one-quarter of the book is given over to the frescoes. Gli affreschi in San Filippo d'Agyra a Laurito nel contesto della pittura cilentana della seconda metà del XV secolo [The Frescoes in San Filippo d'Agyra in Laurito within the context of painting in the Cilento in the second half of the 15th century] by Silvia De Luca. It is a reworking of her own university thesis for a doctorate in art history from the university of Florence in 2010-2011. Besides the first 17 pages of color images of all of the frescoes, the text, itself contains additional illustrations of comparable art in the Campania region. The text, itself, is thorough. The person (or persons) now referred to as The Maestro of Laurito may be a single artist but is more likely to be a small school producing work similar to other art in the area, such that all together we are justified to speak of a "style" in the sense that we speak of a Catalan style of art from that period. The comparisons to other better-known and better-preserved art from the Campania of that era are numerous; the best-known is found within the church of San Pietro in nearby Teggiano. It remains an open question whether any of these other artists are the "Maestro (or maestri?) of Laurito". The most intriguing point is that of direction of influence. I like the idea of anonymous "Masters" coming out of obscure hills long enough to be part of the pre-Renaissance and, then, mysteriously, disappearing from the mainstream, perhaps only because of their physical distance from the great cultural centers of their day. (You think Laurito is isolated now?!) That is just idle noodling on my part. The most remarkable thing about all this is the meticulous restoration. 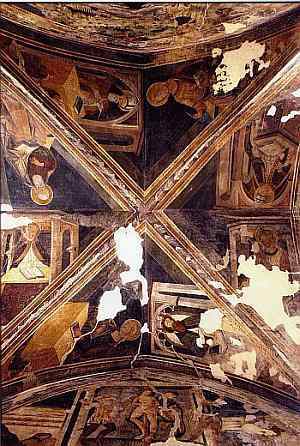 Strangely, and this is irritating, the author, De Luca, does say that the frescoes of San Filippo in Lauro were restored in the first part of the 1980s, but she adds adds that the documentation of the restoration supposedly on file at the Ministry of Culture for Salerno and Avellino could not be located, although some photos of the restoration in progress were found. It's hard to say why, except that the whole Campania was hard hit by the 1980 earthquake and there were other things to worry about than art restoration. It is, thus, all the more remarkable that it got done at all. Now, this book —it's safe to say that this extended photographic essay on the frescoes of Laurito, contained within the larger volume about the town, itself, will be the definitive work for some time to come.